David Blake is a worried man. He should be enjoying the high life now he’s Newcastle’s ‘Top Boy’, the man who controls everything in the city that’s worth controlling. He lives in exiled luxury, while his brother Danny and trusted right-hand men, Palmer and Kinane, take care of business and make sure no one steps out of line. The money keeps on rolling in and Blake is sharing his life with the girl that he loves, Sarah Mahoney. Shame he had to murder her father to save his own skin but at least she doesn’t know anything about that. Blake never wanted to be boss but who else is savvy enough to deal with all of the firm s problems; like Braddock, the rogue drug dealer, who s keeping too much of the take, and The Turk , Blake s new source of product who s taken a million Euros down-payment on a shipment that never arrives. Newly-crowned Glasgow crime lord, Alan Gladwell, wants to do business with the firm and the deal makes sense but can Blake really trust the man whose brother he brutally murdered. Then there is his obsession with the beautiful but troubled Simone, who chooses to work in one of the firm’s massage parlours when she is so much better than that. When one of his men takes two bullets in the back and someone tries to kill him, Blake struggles to stay in control. From the heroin-laced high rises of Newcastle to the seedy back streets of Bangkok, in a world of contract killers, corrupt politicians, bent detectives, coke snorting footballers, fixers, hookers and pimps, Blake is in a race against time to find his potential assassin and discover the truth in ‘The Damage’. I’ve met Howard Linskey and am very glad to report that he’s a very nice chap indeed. I say this with more than a slight sigh of relief as, if that had not been the case, then I could quite easily be currently in hiding, fearing that he might have some ‘friends’ who might just pay me a visit for the fact it’s taken me so long to get round to reading ‘.The Damage’. I read a majority of the novel yesterday, which I should now refer to as ‘The Long Good Saturday’ for its masterful take on the criminal underworld which manages to successfully make the reader at times love and hate its characters in equal measure in much the same way as we once felt sympathy for the villains in a certain classic Bob Hoskins’ movie. 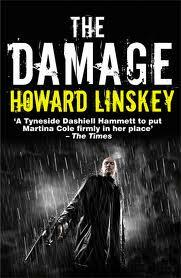 A thoroughly enjoyable ride through the dark streets of Newcastle and much further afield, ‘The Damage’ does exactly what it says on the tin and if that striking jacket image that looks torn from the movie ‘Sin City’ doesn’t already convince you, trust me you are in for some tough gangster action throughout. Now, if I can just work out how to get these shackles off, then I’ll be out of this deserted warehouse – nice of Linskey to leave me some water and chocolate though !